What if a classroom looked more like an artist’s studio? I have spent a lot of time lately thinking about student agency related to creativity in the classroom. Too often art supplies get shut away in a cupboard, or worse yet, rolled down to the storage room, only to be dragged out for art lessons. 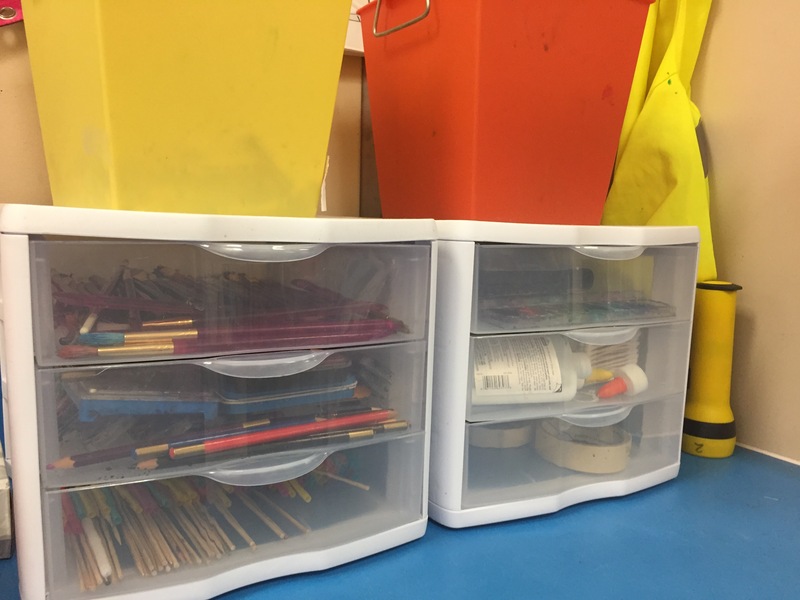 This year, I’m trying something new to me: I moved art supplies out of the cupboard and onto the counter where they are accessible to kids as they need them. In our classroom set up we talked in depth about how to use materials responsibly and, in turn, they are given freedom to use them as they see fit. 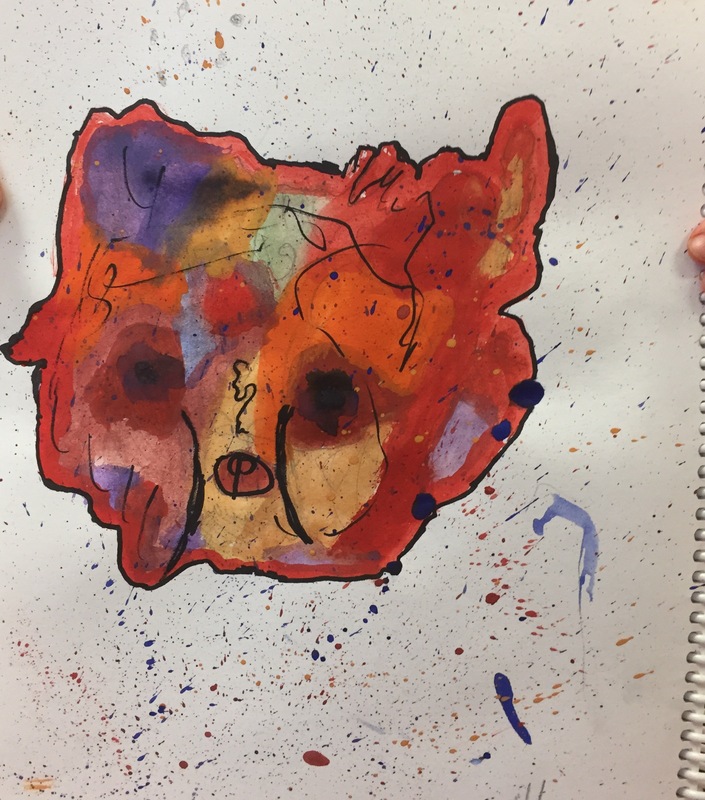 This means not only are they encouraged to create during art period, but they are also encouraged to use art to express understanding in other curricular areas. In preparation for art making, we spend time analyzing art work, being clear that it’s good to critique artist, style, and piece of work. In analyzing work, we have discussed line and colour theory and students picked out shade and tint as being something they wanted to work with. Inevitably, almost, some students don’t use supplies properly, not out of malicious intent, but because of inexperience with the supplies (there is a technique to using a paint brush…) Students have been good about giving each other constructive feedback about art work how to use and care for supplies. I have been stunned by their willingness to make multiple drafts of work and take risks with technique and colour. We watched Austin’s butterfly, a video about using feedback in building excellence in student and the Class Dojo videos about Growth Mindset. Students have been thrilled to look at the results of their drafts. We spent a lot of time setting up students to use their visual journals as their own. I often demonstrate something and ask that they try it but then they are free to make creative decisions about their own work. All feedback is made in pencil or on sticky notes so that students are free to move or erase as needed. I have noticed that many students want a “perfect” draft without teacher marks on it and I respect that. The sign for me that they take ownership is the number of them that ask to take their work home to work on it or share with parents. If it matters that there is colour then it matters that there is artistic decision making. “How do you know if a book is a good fit for you?” I honestly asked the question to my class and quickly lead a conversation about how a good-fit book was a lot like finding a good fit shoe. The “five finger” rule was discussed. Then off to the library we went. And some students still had a hard time picking a book. So I thought some more about how to pick a book. After all, finding a good-fit book is a lot like finding a good fit shoe, but you don’t wear the same shoe to run a 5k as you wear to your best friend’s wedding. Students loved this book by Oliver Jeffers! For many of us there is a visceral pleasure in walking book stacks and browsing titles. Being the first to discover a new book with the still uncracked spine or stumbling accross a well-worn tome with someone else’s annotations in the margins. But for many kids, the library or book store is too full of books and overwhelming or a place where magic simply doesn’t live. So we need to support them as a community of readers. In my classroom, when students read something good they are encouraged to share. We save a few minutes each week for students to read aloud to one another and tell why the LOVED a book. Not for marks. Just because books are awesome and need to be shared. I also stock the classroom library with books from the school library, carefully curating for my students so that there is a little of everything. My goal in the coming months is for my students to take over the job of curating. How should we organize the library? What kinds of books should we include? What do the children in the stories look like? Where are the writers of the stories from? Why should we care? This project involves students by having them create an “art card” book review for a book they loved. They create a small work of art to represent the book they read and then an audio clip where they review the book. The art card becomes a trigger for the audio file by using the Aurasma app. In addition to creating formal time for sharing books (we do a breakfast book chat 4 times a year where students eat breakfast together and talk books), I think there needs to be a network of readers built into our classrooms. We come to know one another’s tastes in books and know that Kevin enjoys funny books while Jane loves sweet stories about animals. If you’re looking for your next great read ask a friend. My students keep a book box and I’m asking them to keep a TBR (to be read) list at the back of their Daily 5 journals. It’s a nice way for them to keep track of what they are reading and what to read next. When students are looking for something to read I often send them of in the direction of an author they already know and love or to check out a section of books on a related topic. Take a risk! You might find something you love! I always knew I loved wordless books but never considered reading graphic novels. Until I did. I’ll never look back. Some kids really just don’t get into fiction. And that’s ok. If a made up story isn’t turning their crank how about a good non-fiction or a historical fiction. There are so many to choose from. So what are you wondering right now? We have to let students read because it’s fun and interesting and not because they will be required to report on their reading. Social platforms allow for interaction about reading. This is to be used carefully with young readers but they can easily use a classroom “tweet” wall where they share a thought through a sticky note or a quick book talk on a closed website. I have had more than one student come to me in tears because their ability to decode text did not match their ability to understand story. Wanting to read a novel but unable to access the text they felt helpless. So we tried many ways, finally settling on reading the book with the support of the audio book. This can be an especially powerful tool for our immersion students who benefit from hearing words at the same time as they see them. Please don’t plod through a book you hate. If the book jumps the shark or just plain peters out it’s ok to walk away. I respect this general guideline, but that’s all it is. In the end students need to understand that the goal of reading is to understand the text and I’m not sure many of them understand that, haltingly decoding their way through a book that exceeds their reading ability and confidently declaring their level but unable to talk about their book! It’s not about the number! Please let kids love books. When they stumble through it they enjoy it in a different way than when they read it for the fourth time fluently and with expression. I am living proof that I can read a book with fluency and expression and have no idea what the book says… hello bedtime stories. Sometimes I love them. Sometimes I have no idea what I just read… take chances. Read way above your level. But also take chances and read below your level and find a book that speaks to you in another way. Happy reading everyone! 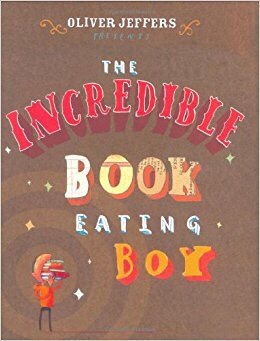 I’d love to hear your ideas on how to hook kids on books! The further I dig into Regie Routman’s Read, Write, Lead, the more I feel that The 2 Sister’s (also here) Daily 5 and Café literacy structures help teachers meet the criteria of an effective literacy classroom. My own interest is technology-supported second-language literacy, lately with a focus on disciplinary literacy. I always hesitated to do Daily 5 in French and English in my classroom (Grade 3 is the first time students get English Language Arts in addition to French Language Arts) because it felt like too much time “lost” to reading, but Routman suggests that teachers don’t allow students enough time to engage in uninterrupted reading. That being said, the independent reading students do must be supported by the teacher. This is a fine balance; careful monitoring and support of student reading but not so micromanaged that it takes the joy out of it. That is the precise reason I am not a fan of home reading logs – tracking number of minutes and number of titles read in exchange for anything takes the innate joy out of reading. Reading is for fun and for information and I want my students to see it that way. That being said, I conference with students about once a week about the books they are reading to ensure they are a good fit and that students are aware of and working towards their logical next steps. In immersion, the cognitive load of students is double: not only are they acquiring the ability to interpret text, but they are also working to acquire a second language. Primary school students acquire language the same way any speaker of a language does (listen to small children learn language – every time I do I remember my love for linguistics). Students need to hear language but they also need to USE language. In our language classrooms, teachers need to ensure ours is not the only voice being heard. He who constructs the meaning does the learning; let students do the talking. How do you pick your next read? Are you aware of the cognitive processes that go into it? We listen to friends. We browse book stores and libraries. We dig into book reviews on Amazon. Sometimes we catch them in the wild. Sometimes we track our reading using social annotation or social reading sites like Goodreads or the local library’s tracking feature. We as teachers need to provide students with these same opportunities. The purpose of tracking reading cannot be accountability to the teacher but accountability to one’s self and working towards one’s goals. Let’s not forget that the ultimate goal of teaching literacy is to develop students who are able to interact independently with text for multiple purposes. We must know our learners as readers, but, more importantly, our learners need to know themselves as readers. This is where learning management systems such as the Calgary Board of Education’s IRIS are invaluable. Students need a place to reflect on their learning and they need agency. Translanguaging involves allowing students to access their full language repertoire. Many bilinguals are not even aware that they speak multiple languages. There are simply the words used with one audience and different words used with another audience. As immersion teachers, we tend to tamp out the use of a student’s maternal language in favor of the immersion language. 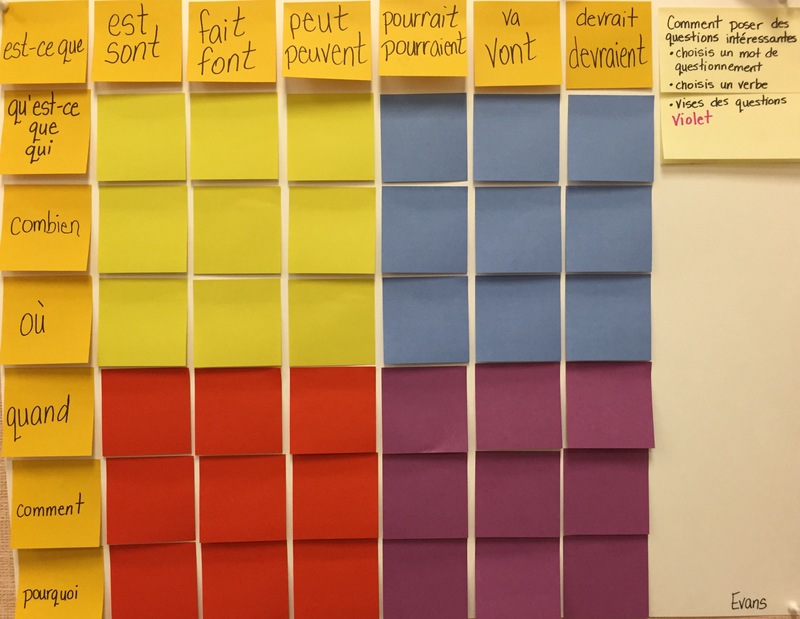 Immersion tends to ignore the fact that students speak other languages but if we intentionally teach them metacognitive comprehension strategies that draw upon their first language student’s literacy skills will be enhanced. We do it in our first language, amassing vocabulary throughout our lives and building upon our understanding of linguistic structures as we learn. We need to leverage this for our second-language students. When I was about 8 or 9 years old, I dug up a copy of W.O. Mitchel‘s Who Has Seen the Wind at my local book mobile (remember the old days when library books came to rural areas on a bus?) because I remember my mom talking about how it was an important book in Saskatchewan. The librarian made me put it back because she didn’t think it was a good fit for me. Crushed, I put it back. I hadn’t actually intended on reading it but on having my mom read it to me. To this day, I have not read that book. When I must have been about 10 or 11 my mom went back to university and read Margaret Laurence’s The Stone Angel. I found the book on the bottom shelf of the living room book shelf and settled in with it, reading the book and enjoying my mom’s annotations in the margins. Did I understand it the same way she did? Surely not. But I loved that book. Just because a book looks like it might not be a good fit doesn’t mean that readers can’t access the story. As an adult, roughly 50% of my reading is audio books. I participate in endurance sports (and for many years participated in endurance commutes) which means that if I want to read, I have to do it while I do something else. One of my family’s favorite things to do on long road trips is to plug in an audio book. While we may not engage in close reading while doing so, we do engage in shared story. If we as teachers know that approximately 10% of our learners have difficulty accessing text, then we need to find accessibility options for our students to engage. Above all else, our classrooms need to make space for joy in reading! If we take pleasure in books and help our students find the happiness in shared story everybody wins! This bit of awesome happened the other day when a student brought in an old wasp nest as we designed our classroom. An awesome bit of see, think, wonder followed. Loved it! Inquiry is a way of approaching classroom learning not a box to check off in a long list of classroom “to do’s”. I think the quote is mine but I have done so much reading lately that I may well have appropriated it without realizing it. 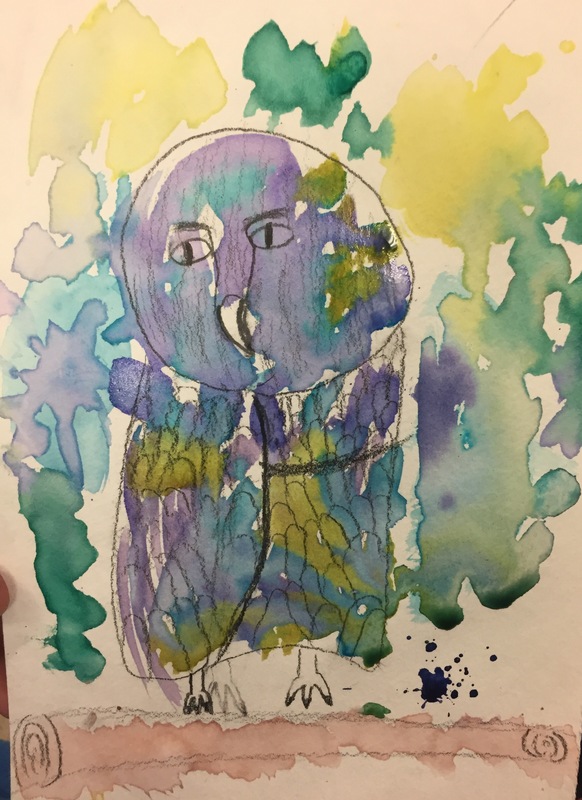 This post is a reflection on my year as we draw to a close, in which we imperfectly inquired and I learned as much as my students, although we learned decidedly different things. 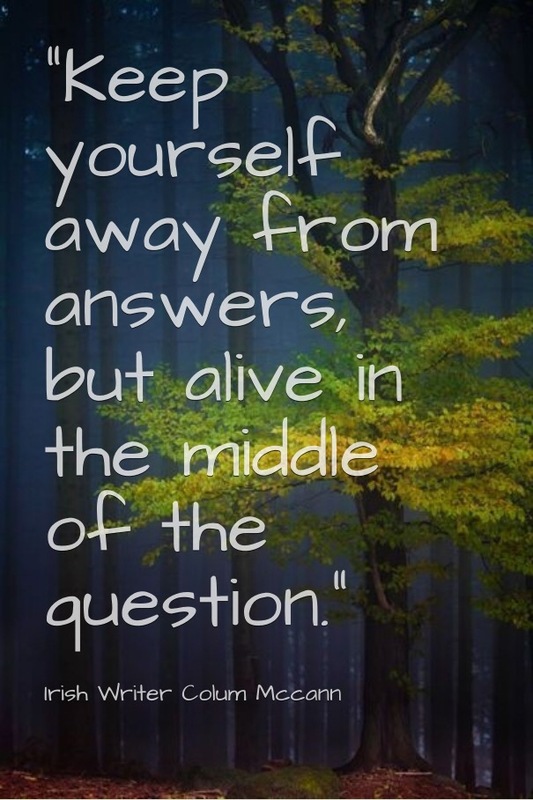 What if we brainstormed in questions instead of answers? We have been using the chart to help create questions but I have been finding that questions become a little forced that way as every student aims to ask a million dollar question. A better way to use it might be to ask authentic questions as they occur to students and then to sort them out into where they fall. 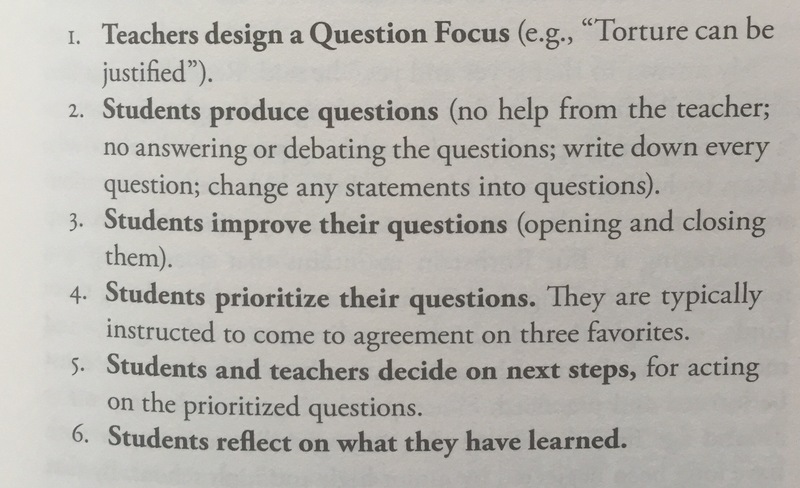 Berger suggests having students work with their questions to boil them down to what it really being asked. Open the closed questions. Close the open questions. Sort them and group them until students determine what it is that is really worth the effort to pursue. It has been interesting to watch my students become questioners and to watch them interact with one another’s questions. It has become common for students to state that they “think they know the answer to that question” and to back up how it is that they know it. The metacognitive piece has been an interesting bit to grow with students – and yes, they sure do know the word “metacognitive” and “distributed cognition” – will they remember it in a year’s time? I doubt it. But I hope the habit of questioning and of thinking about thinking sticks with them. 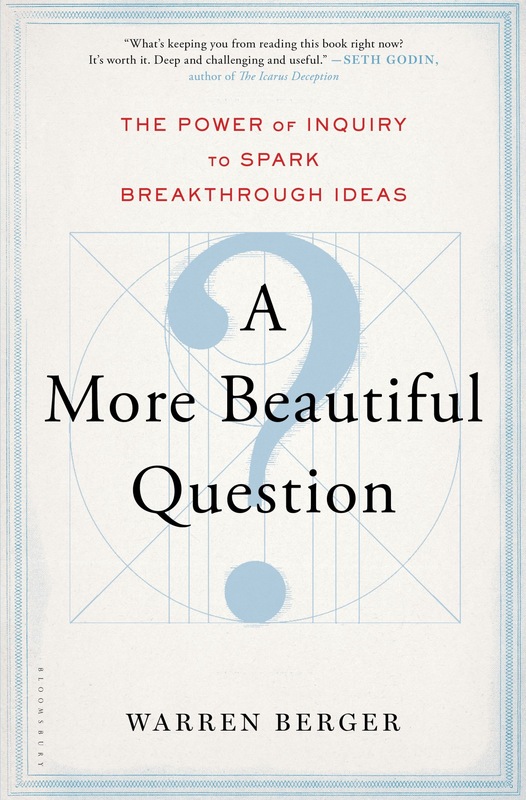 Berger suggests that questioning “why” without “what if” and “how” is just complaining and that to move toward actionable questions and research that questions move to “why, what if, how”. This has been a habit we have tried to develop especially in our science work lately to make for rich “maker challenges” in which students are really thinking about the why of their work. I have been obsessed lately with the deskless classroom and environment as the Third Teacher, so much so that I will be co-moderating a discussion on using design thinking to help students remake their learning space at EdCampYYC 2016. We need to build spaces that look more like learning commons as classroom. “Ideas don’t happen alone at the lab bench, they happen at the conference table. The liquid network where ideas jostle together.” A good idea comes from a complex network of interactions. (Johnson) If ideas have long incubation periods, how do teachers create an environment that allows for that long incubation time? Allow hunches to connect with other hunches? Allow students to turn ideas into something greater than the sum of their parts? Every morning, my routine is to enter my classroom, drop off my bags and review my expectations for the day. Before students come in, I post the daily schedule. Some things I look forward to more than others but I always know which parts of the day I’m most excited about. When students come into the classroom they are in the habit of looking at the board. Usually there is a “yes!” and a little happy dance when something good like Genius Hour is on the schedule. I have been thinking lately, though, about motivation and why as the classroom teacher I get to be “the decider”. Before leaving home in the morning, I what parts of the day I am most excited about. Why should that be different for children? 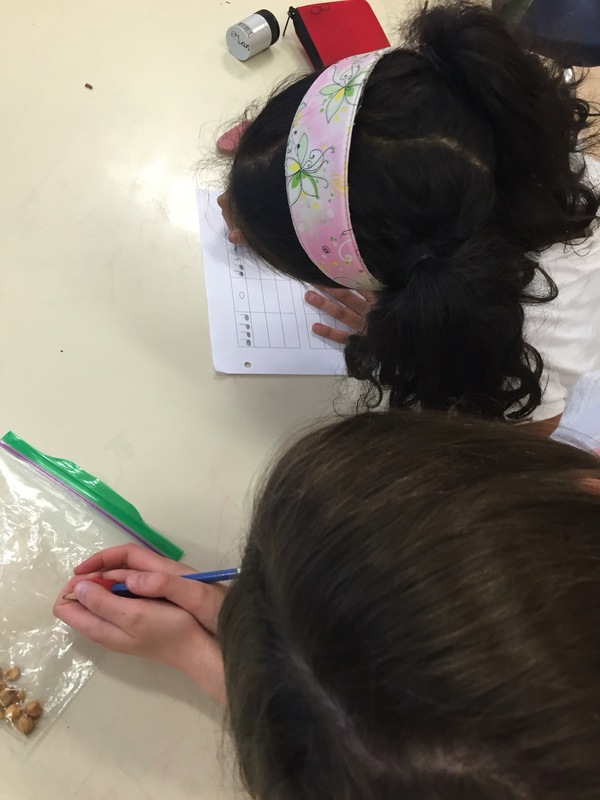 What if our classrooms looked more like a conference and less like a prescribed schedule? What if students had more choice in their day? Some things need to be fixed on the schedule – when there are 600 students and only 1 gym or 20 classrooms and only 50 laptops there has to be some scheduling, but how can we build a more personalized experience? What if a classroom worked more like an education conference? I have been playing lately with the idea of the learning commons as a classroom or classroom as learning commons and using a playlist instead of a schedule. It would require students having a handle on what they know and what they need to develop. Teachers, too. The very idea of letting students just “go” and fall through the cracks is scary. Students who don’t already know how to advocate for their needs would need to learn that skill and teachers need to use professional judgement. It’s not a free-for-all when it’s carefully planned. Personalized learning takes student autonomy, careful documentation and reflection on learning, co-planning, and careful goal setting. In my opinion, personalized learning is not adaptive learning environments. While I see the good in including some adaptive technologies like Lexia or Mathletics, this drill-and-practice learning is not understanding. When a child needs to learn multiplication tables adaptive learning can be a huge help but real learning is messy and I worry when we teach students that learning is just progression up a ladder. I recently saw a picture of a school where there was a cubicle for each of 300 students, touted as being “innovative” because every student was participating in adaptive learning at the same time. “Look ‘ma! No teachers…!” Yikes! Is the “cubicalization” of education what we really want for students? We can be alone anywhere… We cannot be together everywhere. I think more than learning to be apart, students need to learn to come together and technology is one of the many intermediaries for collaboration. I have seen even very young learners collaborating to produce one coherent product that demonstrates learning and providing one another with feedback on content and mechanics of learning both face-to-face and online. Accountability remains a concern for me. When it is poorly managed, I think it’s easy for students to slip through the cracks in a personalized approach. Students need to be accountable to themselves, to teachers, to parents and need to really reflect on what they know, how they can show it, and what they need to know. I do think this is possible even for very young learners. When we weigh risks in education, I’m not convinced that a traditional approach in which every student is doing the same thing at the same time is less of a risk than a personalized approach. Is it easier to manage as a teacher? Yes… Is it worth turning kids off learning by telling them what to learn and how to show it? Goal setting and demonstration of understanding is important. In my experience, when students are given the power to choose what and how the engagement goes way up. Alfie Khon wrote here about the overselling of ed tech and said “show me something that helps kids create, design, produce, construct — and I’m on board. 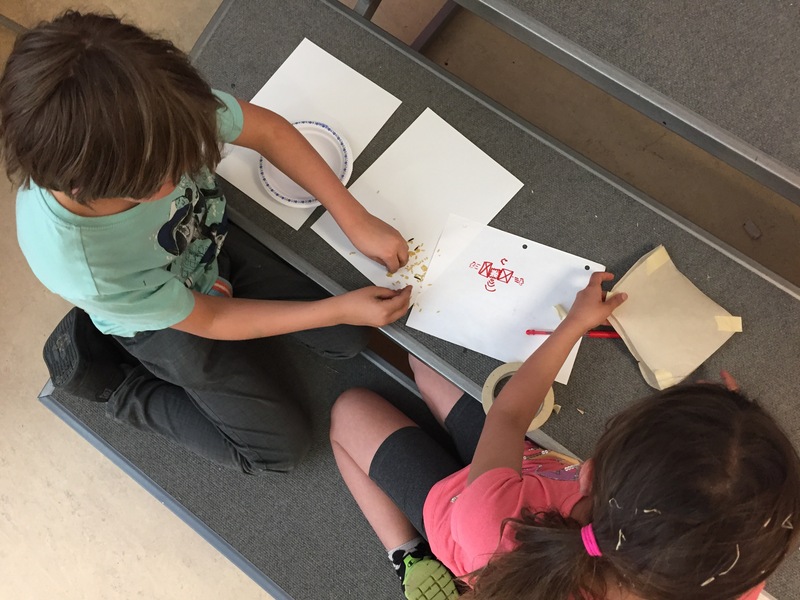 Show me something that helps them make things collaboratively (rather than just on their own), and I’m even more interested.” Collaboration is key! Where do ideas for teacher and for students come from? They come from the lightning that is what’s in your head meeting what’s in my head and transforming the sand in both into the glass of something greater than what existed before. Ideas come more from collaboration than they do from working alone. I think we need to provide students with the opportunities and spaces to interact, to learn from one another, and to demonstrate that learning in a way that makes sense to them.